What\'s the story behind the Shivpal-Akhilesh power play? What\'s the role of the upcoming zila panchayat chairmanship elections in this civil war? This year marked the first time in 18 years that Akhilesh Yadav was in Lucknow and didn't go for the inauguration of the Saifai Mahotsav in his father's ancestral village on Saturday, 26 December. Then, on Sunday, he again cancelled a plan to go to Saifai to inaugurate a village cricket league. These snubs strengthened rumours that Akhilesh was angry. Why? 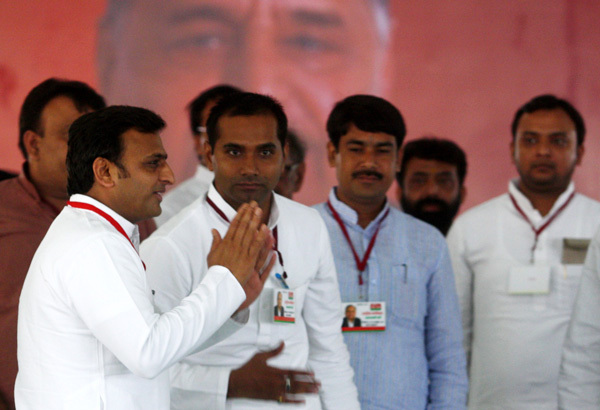 Just two days before, three young leaders of the Samajwadi Party - Sunil Yadav 'Saajan', Anand Bhadauria and Subodh Yadav - had been suspended. Also read - Bloody record: Is 'secular' SP more communal than the BJP? Of these, Sunil and Anand are considered Akhilesh's right-hand men, while Subodh is the son of Etah MLA Rameshwar Yadav. It is being said that the decision to suspend these three was taken personally by Mulayam Singh Yadav. But Akhilesh is not at all ready to accept his father's decision. A member of Mulayam's family told Catch: "Akhilesh is extremely angry. He has taken it upon himself to get Sunil and Anand back into the party, so it won't really be a surprise if they do return." The civil war in the first family of Uttar Pradesh had been bubbling beneath the surface for sometime. But what made it come out in the open is the battle over ticket distribution for the upcoming elections to the chairmanships of district councils (zila panchayat). The elections are not just a matter of status - there's also a lot of money involved. A zila panchayat chairperson has access to nearly unlimited money and resources. Political parties, too, get a lot of benefits, which is why every group within the SP wants to grab power. Political analysts see another reason behind this upheaval in the party - every group is afraid that the SP may not come back into government anytime soon. In such a scenario, every leader is trying to get his or her associates elected to a district council chairmanship. A few days ago, Mulayam handed the responsibility of overseeing these zila panchayat elections to his cabinet minister brother Shivpal Singh Yadav. And just a day before the Saifai Mahotsav began, Shivpal suspended the two Akhilesh aides. The reason given for the suspension was that Sunil and Anand were opposing party-backed candidates, and thus indulging in anti-party activities. Usually, when someone is suspended from a political party, there's some sort of timeframe attached to the suspension, which was not the case this time. Anand hails from Sitapur and has been national president of the party's youth wing, the Lohia Vahini. From his native district, one Seema Gupta has been given the SP ticket for the zila panchayat elections. Seema's husband, Shivkumar Gupta, was earlier in the Bahujan Samaj Party, and the fact that an ex-BSP man's wife got a ticket incensed SP workers so much that they pelted stones on her car. Anand is alleged to have been behind this. Sunil, who hails from Unnao near Lucknow, had allegedly got the candidate from Lucknow district changed. The party had decided on Vijay Bahadur Yadav's name, but Sunil allegedly got him removed in favour of one of his close aides. He is also said to have opposed some other candidates. When this information reached Mulayam, he gave Shivpal the power to take appropriate action. And as soon as he got Mulayam's authorisation, Shivpal suspended Akhilesh's aides. The order bore Shivpal's signature, while the state party president is actually Akhilesh. It's ironic that Sunil has become a pawn in this game. After all, one of the things that made him gain Akhilesh's trust was what he did for Shivpal back in 2008. Sunil was leading a protest to restore the students' union in Lucknow when Shivpal arrived to throw his weight behind the students. In an unprecedented development, a UP Police constable slapped Shivpal. In the melee that followed, the police fired on the demonstrators, and one SP worker was hit by a bullet. Sunil tried to save Shivpal, and got injured in the process. The police arrested him and kept him in custody for 19 days. Anand Bhadauria being assaulted by then-Lucknow DIG, DK Thakur in 2011. It is said that this made Akhilesh take notice of the young leader. Then, on 9 March 2011, Lucknow SSP BP Ashok arrested Akhilesh at the Amausi airport. To protest against the arrest, Lohia Vahini head Anand and Samajwadi Chhatra Sabha chief Sunil were proceeding to gherao the UP assembly. The then-Lucknow DIG, DK Thakur, pushed Anand to the ground and tried to crush his face under his shoe. In the following lathi charge, Sunil broke his arm. The lathi charge was so brutal that on the basis of photographs taken at the spot, the National Human Rights Commission had issued a notice to Thakur. This made the two leaders part of Akhilesh's inner coterie. It is also said that Akhilesh's 'cycle yatra', which played a key role in winning the 2012 assembly elections for the SP, was Sunil and Anand's brainchild. In a way, Shivpal's decision is a direct attack on Akhilesh's young core group, which, apart from Anand (the Thakur face) and Sunil (the Yadav face), includes Nafees Ahmed (the minority face). All three began their political journeys from student politics, and help Akhilesh maintain political and class equilibrium. By suspending two of these three, Shivpal has flexed his muscles for the first time since 2012 which, incidentally, was the last time he had held major responsibility. Back in March 2012, when the SP came to power with an unprecedented majority, Akhilesh was widely tipped to be Mulayam's choice as CM. But Shivpal continued to insist that the decision would be taken by Mulayam, probably harbouring hopes of being the chosen one, or at least the second-in-command behind Mulayam himself. But 'Netaji' chose Akhilesh. Cut to 2015, and Shivpal has surged back into focus. 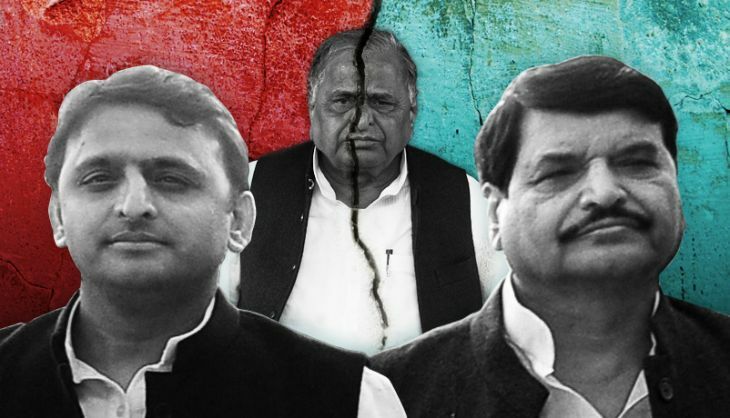 Insiders say the fact that Mulayam's cousin Ramgopal Yadav has seen his stature diminished due to links to tainted Noida chief engineer Yadav Singh is the reason for Shivpal's resurgence. Last month, at Nitish Kumar's swearing-in ceremony in Patna, Shivpal represented the Samajwadi Party. In recent days, Shivpal has also met Amar Singh numerous times, and also mediated a meeting between the sidelined former leader and Mulayam. The divide within the family can be gauged from how Ramgopal and others gave Amar Singh the cold shoulder, while Shivpal continued to be in touch with him. It's obvious that this family soap opera is nothing but a power play between uncle Shivpal and nephew Akhilesh. Who blinks first remains to be seen, though Mulayam could once again emerge as the umpire who has the final say on this match. China ends one-child policy. But is it years too late? READ NEXT >> China ends one-child policy. But is it years too late?